The picture here is self explanatory. What sort of problems arise from the most mysterious and long awaited fifth character class? And why has the female version not been revealed yet? Can the scroll pouch be emptied so it can carry javelins instead? Is the library equipped to handle the clean up of so much blood and carelessly flung monocles? Click through below to follow the dissection of the disgruntled librarian who plays by his own rules. 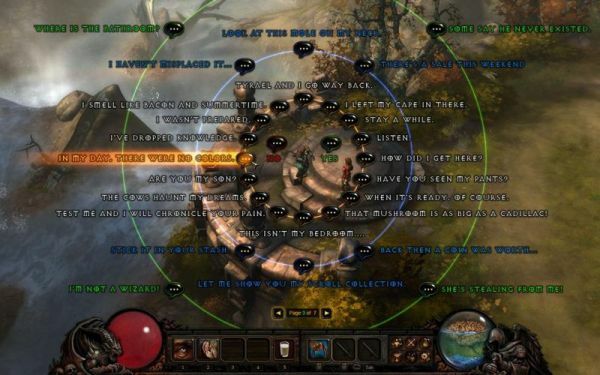 What a surprise it was to learn the fifth character class in Diablo 3 would be not a ranged expert, but rather a tired and paranoid bookworm: The Archivist. Or is it just ‘Archivist?’ Your choice, of course. Some say he can’t hold a candlestick next to Cain, though I suspect both men’s beards are equally flammable which prevents any testing. All sorts of other paper cuts?I mean problems?come to mind just from looking at him. Will he render the Wizard redundant by being more formidable in his studies of…studying?? Will he go berserk if anyone asks about his missing eye? Can he still party it down with the younger crowd in the dorm rooms of Westmarch or will they all assume he is a narc? If he says ?Shush? to his grandmother, will she explode too, and just out of curiosity, does this work over the phone? I would say yes to all. He is, after all, a pretty intense guy. He kind of looks like Jesus with his blue and red robes, beard, and sandals. In fact, it looks like they were browsing over the bookshelves quietly until you know who came along and started an altercation which ended very badly for the denizens utilizing the public faculties of the book depository. They were probably looking for information on an archer calss in the expansion. Then, when using Quest Bolt, the Archivist goes over and totally ransacks one of the bookshelves. You can’t blame shoddy carpentry on this one. No more old geezers in the library, I say! Time to sweep this relic out into the harsh world like a dust bunny. But can he survive out there? I can hear the coroner now… ?It looks like he died to death. You heard me right. He just stepped out into the non-musty outside world, breathed in the non-cobwebbed air, and died to death right away. See those tumors still popping out there? Those are from sunlight.? Unbelievably, he crumples in one hit all the time and has no armor other than (you guessed it) an unfitting shoulder pad. I knew they would do that. And just to make absolutely sure he could never properly use a bow, he lacks depth perception by only having one eye. And what if there are four Archivists in one game? How do you explain all of them having the same eye injury? What kind of armor is he supposed to wear, paper hats? It is as though the whole concept of the Archivist is some sort of joke. Book vision: makes stuff glow…because pretty much every click has to create a light show. Lorenado (which is an anagram of Leonardo): shows Blizzard’s very weird obsession with things that whirl. The game is packed with this stuff: Whirlwind, monsters that whirl, Energy Twisters that you can fit in your pocket, etc. You know who else was into whirly things? Leonardo. Quest bolt: NPC’s will harass you as exclamation mark junkies just like in Diablo 2, and this will cause everyone to stop and (…gulp…) listen. You better take time out of your busy schedule to click on them…or else. Shush: all things must explode all the time. Plus, he is hunched over. So as it turns out, the Archivist seems to personify all the annoying weird fetishes the designers have put into Diablo 3 which only distract from the real action. And with no archer class in Diablo 3, I am baffled as to why there was never a complaint fest of monumental proportions regarding the official announcement of this class! Note how the mana orb is actually a brain in a jar. This is no doubt Blizzard’s way of communicating that they are brainstorming different resource systems. I say let us cast everything for free, but what do I know? The rest of the picture is a bunch of phrases that old farts like to pester you with…old farts like Cain (whom many players wanted to play as) which was the inspiration behind this entire character. Are you people serious? You want to play as a hobbling old fart? Now look what you’ve done! If you scan carefully, you can make out ?page 3 of 7? near the bottom. This rambling radial dialogue goes on for seven pages?? We’re doomed! Much more interesting is the girl he is rambling on to in the picture. Who is that girl? And why is she wasting her time with that guy? She looks meaty enough to be an Ama…no, I dare not say it. Maybe she is just some voluptuous commoner, but I like her already, even though she is pale as a zombie. Her posture should be a leading example to all. It’s journal entry “0041” or 4/1, also known as April 1st. The Archivist was originally called The Lorekeeper. In the “Shush” skill video a piece of wood falls right as the Archivist explodes, but it wasn’t a planned part of the explosion. The original concept of the joke was to create a Deckard Cain class, a frail old man more concerned with reading books than fighting, and so the existing Deckard Cain model was used for all of the website assets. Including an animated version sporting dyed hair and an eyepatch. Um. Ok, maybe not. That was all completely pointless information. If two Lorenados hit each other, can you create and dupe books as the pages flutter onto one another, and more importantly, will we have to look up these odds on the Internet? If two Archivists cast Shush and self destruct, who wins? And who blows up first? As it turns out, the Archivist is far more dangerous and disturbing than any ranged class. The Archivist hides away in old bookstores and loses himself in dogeared paperbacks like a ranger hiding in the jungle foliage. ?Trees shall be made into paper, not arrows? is the new philosophy. He pretty much does whatever and kills whoever he wants, maintaining a stranglehold on the once quiet study halls. For ranger fans, our only hope is that he can somehow construct paper airplanes that can be biffed at opponents with gale force. Hopefully, we can all learn a lesson from this. Next time you state to Blizzard who you would like to play as, for god sakes say, ?Tyrael. ?